The 30-year-old scored yet another Premier League hat-trick on the weekend. Wolverhampton Wanderers, beware. Manchester City hitman Sergio Aguero is on a high after notching yet another hat-trick and he’s just gone and scored a worldie in training, with the outside of his boot to prove he’s not going to rest on his laurels anytime soon. 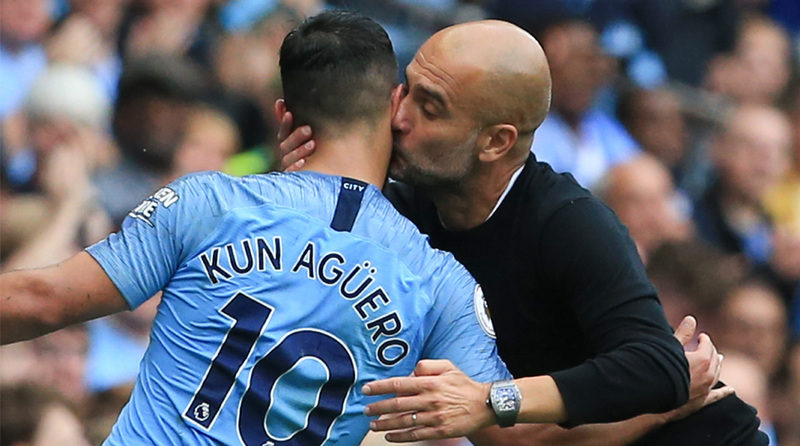 Sky Blues manager Pep Guardiola gushed about Aguero in his post-match interview, declaring that the Argentine was in ‘the best shape of his life’ and backed him for another goal-laden season. Up against Ederson in a shooting drill, Aguero left the Brazilian custodian rooted to his spot and that’s no mean feat. Along with Tottenham Hotspur frontman Harry Kane, Aguero is definitely the best striker in the English top-flight and he’s currently topping the scoring charts with three strikes to his name. Merseyside wingers Sadio Mane (Liverpool) and Richarlison (Everton) are level with Aguero too, but it’s likely that either of the aforementioned duo will pull away from the rest of the pack sooner rather than later. City have made a blistering start to the season, comfortably beating Arsenal 2-0 away before following it up with a resounding 6-1 result over Huddersfield Town, where Aguero registered his treble, on the weekend. They next take on promoted Wolverhampton Wanderers at the Molineux Stadium on Saturday at 1700 IST in the final league fixture before the international break ensues. Topping the table with six points from two games and a healthy goal difference of +7, the Sky Blues will be overwhelming favourites against a side that are yet to register their first win since returning to the Premier League.